A Scan Eagle Unmanned Air Vehicle prepares to launch from an amphibious transport dock class ship USS San Antonio (LPD 17) on Nov. 28 off the coast of North Carolina. The flight on the San Antonio LPD class ship was part of a post-installation and functional flight-check exercise. Scan Eagle’s first deployment aboard USS San Antonio is planned for summer 2013. Since 2005, Scan Eagle has flown nearly 250,000 hours under the Naval Air Systems Command's Intelligence, Surveillance and Reconnaissance (ISR) services contract. Defense contractor Insitu owns and operates the Scan Eagle UAV. 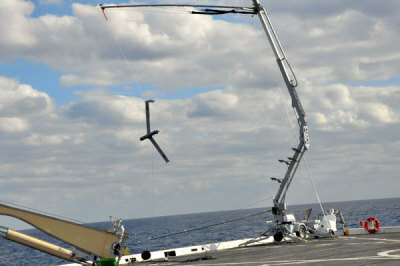 The 44-pound UAV is predominately flown off Navy DDG-51 destroyers. Recent and upcoming ISR services on amphibious warfare ships are a precursor for the Navy and Marine Corps' plans to field and operate the expeditionary RQ-21A Small Tactical Unmanned Air System from the sea. The RQ-21A Integrator just completed land-based testing and is scheduled to begin shipboard testing early next year.